Because of the need all of us have for examples, God wisely chose to give husbands an example so they would know their responsibilities in relation to their wives. Interestingly, God’s choice for an example in this area was never an earthly husband Himself! 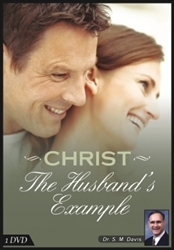 In Ephesians 5, God clearly declared that Christ would be the husband’s example. In other words, husbands should assume the same role in relation to their wives that Christ has assumed in relation to His church. There is a very clear comparison here. The husband is to be like Christ. The wife is to be like the Church. This also means that the husband bears the greater responsibility in God’s sight for the success of the relationship. Price He paid and continues to pay for His bride. Potential He develops in His bride. Patience He shows toward His bride. Promise He keeps in relation to His bride.